The relationship between us and the work environment is a quid pro quo arrangement. We are aware of the fact that society is severely impacted by the climate in the workplace as well as of the notion that we also bring something to the table. Thankfully, due to the ever-increasing awareness of the importance of such matters, the health and safety parameters in the workplace have become immeasurably sophisticated when compared to their roots in the industrial revolution. 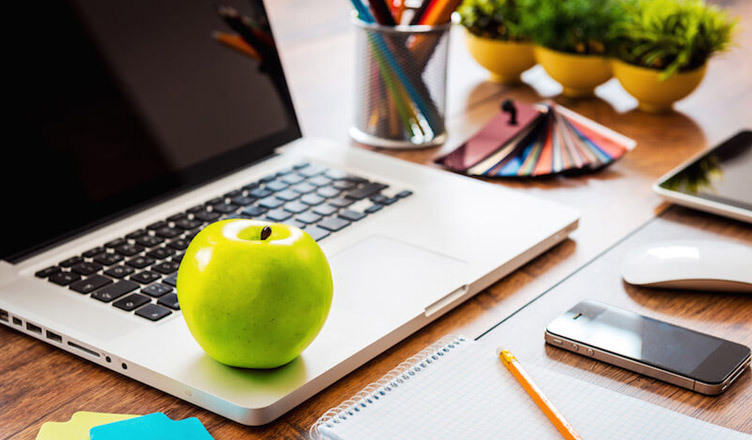 It is just as important to do your part as it is to demand better conditions, so here’s how to promote healthy habits in the workplace. Mindfulness is a buzzword that defines a phenomenon which has been known to mankind for millennia – being present here and now. Still, summing it up into one word makes the notion punchier and a good “package” to disseminate in the corporate world. As it turns out, it is working quite well. This frame of mind that compels workers to concentrate on the present moment relieves stress and promotes creating a tranquil working environment. Still, such meditative line of thinking cannot be incorporated overnight and the co-workers have to work on their individual brains before it begins to influence the overall atmosphere in the workplace. The key thing is to consistently promote mindfulness and lead by example. It is absolutely normal to eat at least one meal at work, if not due to the fact that you spend a third or even half of your day in the office, then due to the calories spent on thinking, working and darting around the building. This is a perfect window of opportunity for employers to influence these habits – especially if you are working with a food service provider. If not, you can still promote healthy eating through a nicely designed kitchen that is always kept clean as well as posters hanged around the kitchen that have all the necessary info about how to engage in healthy eating habits. Furthermore, you can install a very practical water filtration system, so your workers won’t spend money on the over-expensive bottled water and pile on the plastic. A reasonably priced reverse osmosis water filter system is an optimal choice, guaranteeing clean and healthy water that tastes great. You can even get it with a coconut carbon water filter, which will result in a delicately sweeter taste of water that’s often preferred. The layout of the office space can be a deciding factor in promoting a healthy line of thinking – and indeed, habits – during the working hours. After all, humans are predominantly visual creatures, so a well set up office space across all spheres imaginable will undeniably influence their mental and physical well-being. Make sure you get as much natural light into the office space as possible and if you cannot, make sure it is brightly lit. Keep the colours bright; white is always a good base colour and a strong contrast will outline the space in a very pleasant way. The airy feeling of the space that is set up according to these parameters, as well as the overall air quality will keep the atmosphere upbeat. When it comes to the aforementioned air quality, you have to make sure the ventilation system and AC units are as frequently maintained as the kitchen area. Housekeeping has to be professional and efficient because clutter tends to amass over time and, visually, cluttered space is known to have a negative impact on work performance. Finally, reserve an extra space to create a relaxation zone where your workers can decompress and enjoy some quality me time or socialization with their colleagues. Creating a healthy work environment is an overwhelming task, especially if we are talking about big corporations. It is practically impossible for one person to manage this dimension of the workplace, so it has to be delegated. Everyone involved needs to do their part, which means that creating a healthy psychological environment that promotes expression and openness is the first and the most important step on the road to a healthy workplace.